I’ve got the old Trek 420 completely stripped of all its components. The last part that needed removing was one of the rack bolts. It was seized into the frame. I tried everything and had to take the last resort of drilling it out and chasing the threads. That took care of the problem. I’m going to call around locally to find out what it’d cost to have the frame bead blasted here. I thought about chemical strippers, but this frame has so many nooks and crannies that it would take me forever. If I was going to do a rattlecan paint job on it, I’d probably make the effort. But I’m going to have this frame professionally painted and if I don’t get it, the painter will have to redo it. That would defeat the whole purpose. If the local quotes aren’t that good, I’ll just have the builder do the whole job for me. Aside from that, I’ve gotta find a box. I ordered a Dimension steel cross fork with disc tabs and it will be painted the same solid color as the frame. So whatever happens with the local quotes, I’m going to have to wait for the fork to get here first. Then it’ll be off to the builder. I’m starting to have some parts arrive, too. Probably not for this build, but an LX crankset showed up at the door yesterday. 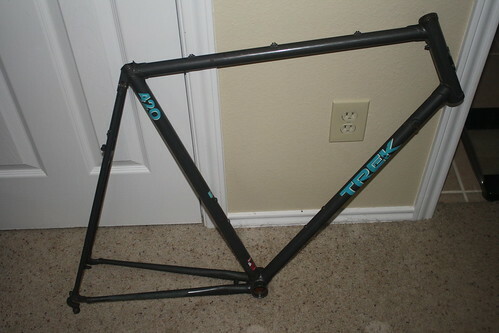 I bought the crankset for this frame on ebay and it’s coming over from China, so it’ll be a little while for it still. And since 1″ stems are really hard to find, I ordered the Thomson 1″ to 1 1/8″ steerer shim so I can use a 1 1/8″ stem and have better fit options. Also a Woodman 1″ threadless headset. I have a set of Avid BB7 calipers/rotors on the way, but I haven’t decided what bars to run yet. I have a straight MTB bar I’m thinking of using with ergonomic barends like the Cane Creeks, but I’m also considering a moustache bar that would require different levers. So, no levers until I decide on a handlebar.